The front porch, once an essential architectural feature of homes, has become a thing of the past. In the days before the twin sirens of air-conditioned comfort and television lured families into their homes, the front porch was the gathering place — the spot where families cooled off on hot summer nights and actually conversed with one another before going to bed. With my grandparents on their porch. That’s me wearing the bow tie! The first home I lived in when I was growing up in South Texas had a porch that spanned the length of our home. And when my grandparents built their new home, they included spacious porches on both the front and back sides of the house, each suited for different parts of the day. I have more memories than I can count of sitting on the front and back porches with my grandparents in the evenings. I learned a lot about a lot of things from them while sitting on those porches. 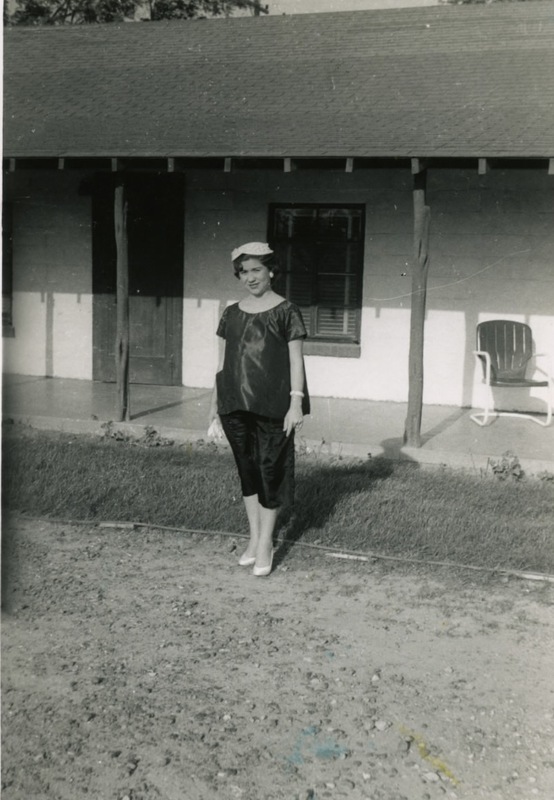 My Mom, pregnant with me, standing in front of our porch. This past Sunday afternoon, my youngest daughter Gina and I set off on a little Texas backroads adventure. Armed with our cameras, we drove down long two-lane roads and stopped to take photos of old homes. 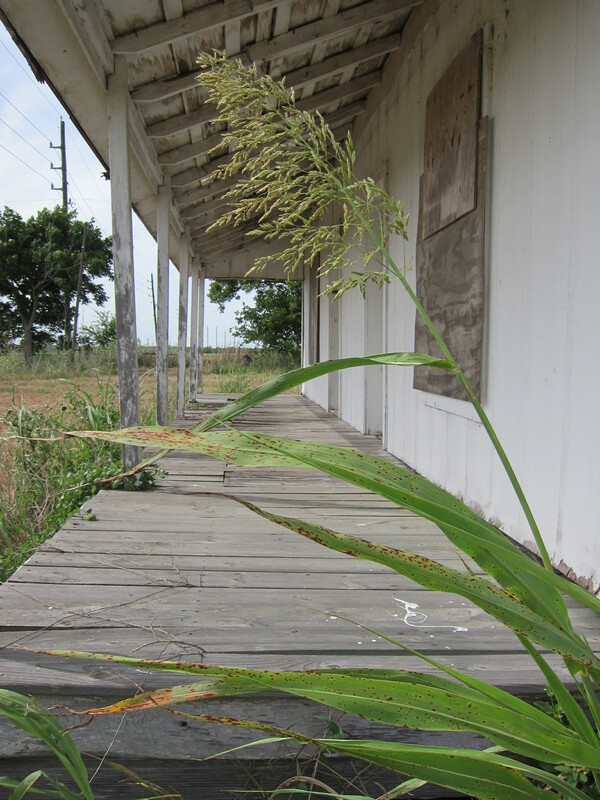 The common feature of each of these now-abandoned homes was the front porch. It was not hard for me to envision what life must have been like for the families who once called these places home — folks just sitting and chatting at the end of long days, watching the sun set from their front porches. One of the abandoned homes that Gina and I drove past on our road trip. I think that we lost something special when we abandoned our front porches and opted to do all of life inside of our comfortable homes. The conversation and interaction of years gone by has been replaced by high-definition television and smart phones that have dumbed us down in so many ways. These devices think for us more than we think for ourselves and distract us from the people who share the same living space with us. 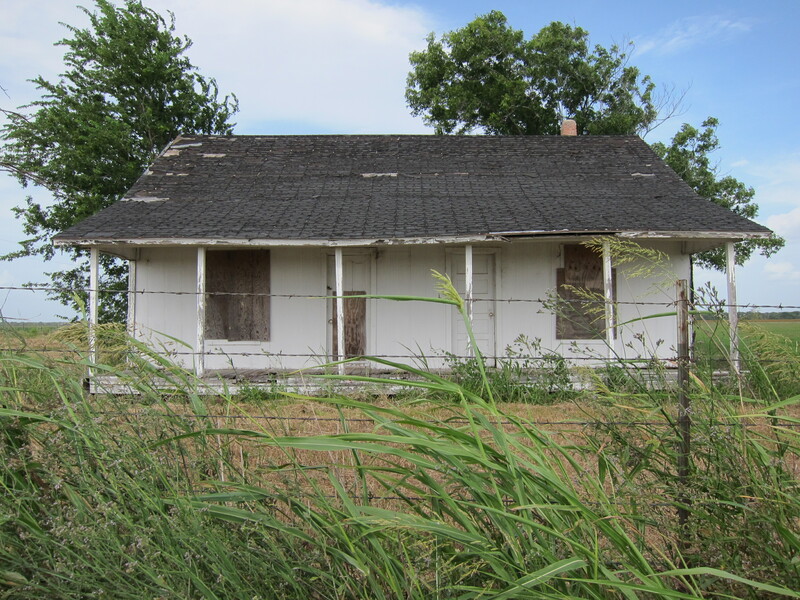 I wonder who sat and conversed on the front porch of this now-abandoned house. Please understand that I am not against progress. However, reflecting on the role that the front porch once played in my life just makes me wonder about what I have given up in exchange for progress. Maybe it’s just that I am becoming more nostalgic the older I get. I do however, believe that we need to somehow recapture the essence of front porch living as modern families. Perhaps that means turning off the stuff more often and actually conversing with others, the old-fashioned way of doing face time! I am grateful for the years that I spent with my grandparents on their front porch. When I close my eyes I can hear their voices, smell the cool grass, feel the summer breeze, and envision the night sky. It didn’t matter to us that we did not have air-conditioning in those days and that there was not much to watch on television. We had something far better — a connection with one another made meaningful because of the time we spent together on the front porch. Such a thoughtful and insightful word. I remember times with my grandparents like this. You really made me reflect back and I could even see my Grandmother’s beautiful flower garden in the yard. You are so right about our technology being a distraction to us. Our family has a back porch that we all really enjoy. I hope we are making these kinds of memories for our kids! Thanks, Desiree. It is indeed sweet to have such wonderful childhood memories. And, as you write, may we be intentional about making similar memories with our own kids and grand kids. Great blog, and a nice looking family. Where were these houses? I grew up in Corpus, and most of my extended family lived on ‘the farm’ outside of Robstown. I loved going out there to visit my aunts, uncles and cousins. We were out there most holidays. We also had a very small cinder block ‘lake house’ on Lake Mathis, now Lake Corpus Christi. We went there on weekends. I remember the windows being open at night and the breeze blowing through off the lake. I think I slept better out there than I have since. I loved that place. No TV, a window unit we used during the hottest parts of the day, but seldom at night. I had a trot line and some drop lines hanging from Willow trees and I would lay on the floor of the boat and nap to the sound and motion of the water moving and the breeze blowing through those trees. Again, very pleasant. Your blog brought back a lot of memories. Thanks for sharing those great memories, Gerry. Gina and I took the pics of the old abandoned houses just north of East Bernard, I think we were on Hwy. 60 at the time. So many old houses like the ones in the photo. 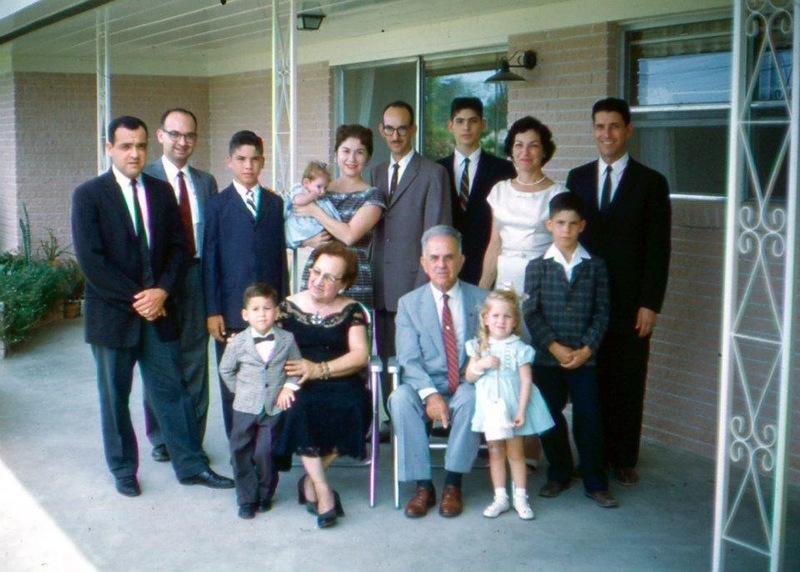 The family homes in the pics were taken in Mission, Texas. Thanks again for sharing your memories. Cheryl grew up in Corpus and they also spent lots of time at a lake house at Lake Mathis. Cheryl has great childhood memories of those days. I love today’s post, Omar. It reminded me of our family porch and all the good family-time we had. I sent it to the 23 family members who are converging on Galveston this weekend to celebrate my 70th! We will be doing a lot of porch sitting! Loved your pictures and all the reminders of times gone by that should still be present in this generation. . Thanks, Nikki. And congratulations on your 70th! Fantastic milestone. Enjoy the time with your family. Hope to see you again soon. Blessings! Great word…. As you know very well, often times when we travel to other parts of the world we are afforded the opportunity to step back in time. My first trip to the Philippines I remember being so fascinated by the fact that EVERYONE just sat outside…. and there was a nomadic wandering from house to house. As we walked up to a home we might find families from other homes in the neighborhood sitting together on that particular patio. All of the ‘progress’ in our day has facilitated really great things on so many different fronts. However, it does seem to be constantly creating new barriers to experiencing real community or relationships. We bought a small $30 charcoal grill (old smokey) at HEB which is easily moved from our garage to our front patio. We did this to facilitate evenings where our family could be out front, cook, and eat together amidst the neighborhood on the patio. I don’t have any mind-blowing stories of fruit yet but we felt like it was a practical step we could take. Thank you, Matt. I have observed the same thing in several of the countries I have visited — families sitting outside in the evenings having conversations, retelling stories, and just enjoying community. My wife and I were talking about this last night and she reminded me of what happened when the power went out after the last hurricane. Everyone in the neighborhood lumbered out of their homes like bears coming out of hibernation. People were actually meeting one another for the first time on their front lawns. Kudos for grilling on the front porch! That is a great step toward recapturing the essence of front porch living. Thanks for your encouragement. Thanks, Jason. Sweet memories of days gone by. Fantastic post! This motivates me to get out on my front porch today!